ITALIAN DIVERS ARE hoping to resume the search for bodies today after the Mediterranean shipwreck tragedy in which 111 African asylum-seekers were confirmed dead. Scores more are still missing. 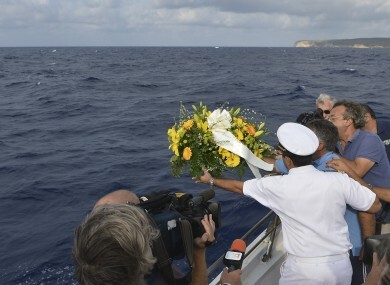 Rough seas have forced the suspension of the operation off the remote island of Lampedusa, where fishermen this morning laid a wreath in the water where the disaster unfolded. 155 people were pulled out alive from the water. “The search is still suspended,” said Leonardo Ricci, a spokesman on the island for the financial police, which also has border patrol duties. “We have a legal but also a moral responsibility to recover all the bodies. There are hundreds of families that are waiting for news,” he said. Divers spoke of “dozens, maybe hundreds” of bodies trapped in the wreckage, which lies on the seabed at a depth of around 40 metres. Ricci said there was a “preliminary plan” to raise the 20-metre long boat, but emergency services were still working out how this could be done. It is feared the final death toll could rise to close to 300, which would make this the worst ever Mediterranean refugee tragedy after a previous one in 1996 also off Italian shores claimed 283 lives. Fishermen from the island, which has a population of just 6,000 people and is Italy’s southernmost point, took four boats out to sea on Saturday in a poignant commemoration for the drowned. They sounded their horns and laid a wreath. Hundreds of islanders attended mass and joined a candle-lit procession in the port town yesterday, calling for a “humanitarian corridor” to be set up in the Mediterranean to allow safer sea crossings for people fleeing war and persecution. Italy has asked the European Union for greater assistance in stemming the influx of refugees, with 30,000 reported to have landed so far in 2013 — more than four times the number for all of 2012. Lampedusa is the main arrival point in Italy. The tragedy has highlighted Europe’s flawed migration and asylum policy, which places an unfair burden on the countries in southern Europe where asylum-seekers first arrive, observers said. Email “Divers hope to resume search off Italy amid fears death toll could reach 300”. Feedback on “Divers hope to resume search off Italy amid fears death toll could reach 300”.